Summer is the time for laid back decor. But that does not mean that it should not be beautiful. 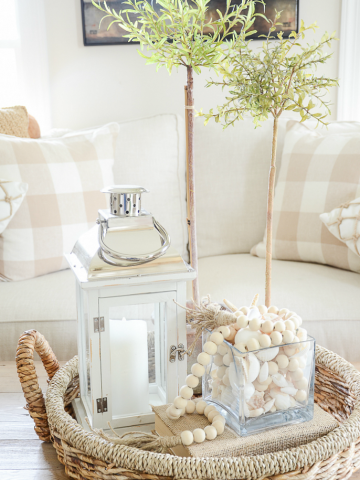 Let’s create a vignette or two or three for our homes that will work all summer long! As the flowers change in your garden so will your vase and blooms but the rest of the vignette can stay the same! Easy-peasy! 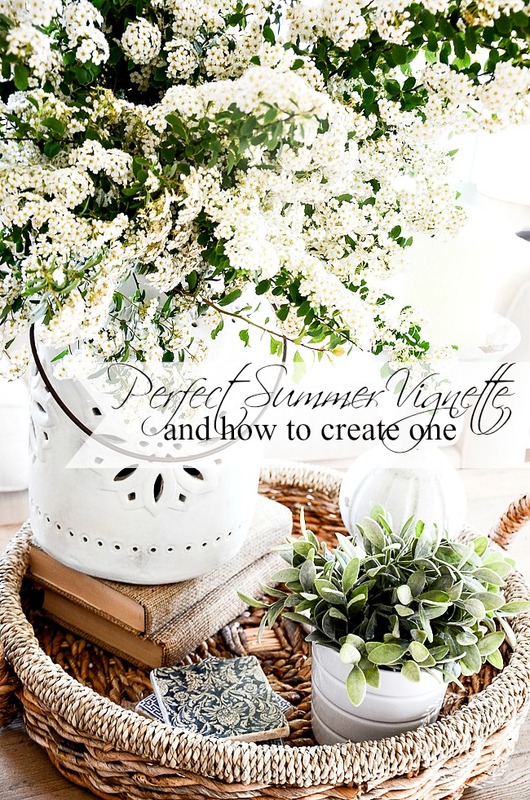 Here’s how I created a summer worthy vignette that will last this lazy hot season! 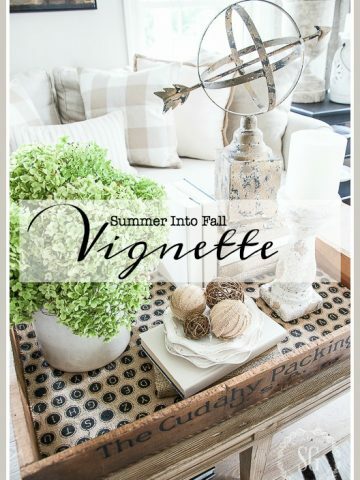 Today on Decorating Tips And Tricks we are also talking about Vignettes! You will love this podcast episode! 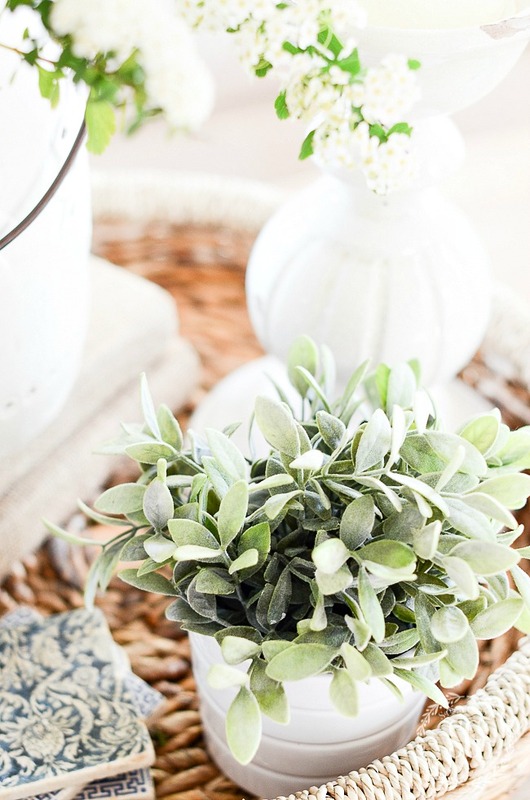 We have tons of ideas and lots of advice for creating YOUR best vignette! And listen to all the episodes HERE. 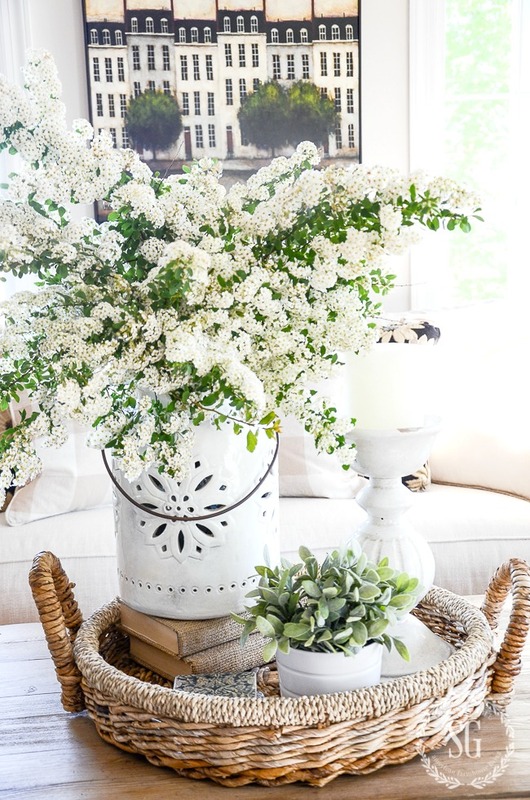 A vignette is the perfect way to decorate for summer. Just make it easy! Nothing elaborate. I’m using my favorite basket for summer decorating. It’s big and has lots of texture. A vignette should be a mix of texture. Nubby, smooth, furry, hard, soft and everything else in between. You don’t have to use every texture but choose a few. I found this basket years ago at HomeGoods. 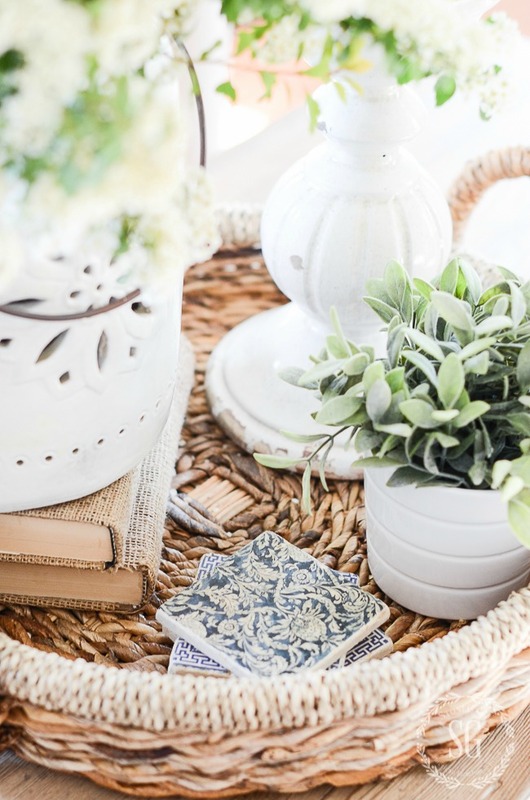 Even though this basket was very reasonable, choosing the perfect basket or tray to gather up your vignette is a place to make an investment. If you find a basket you love it will be something you will treasure and use for years! I have kept the decor inside the basket at a minimum. And let the great weaving on the bottom of the basket show! I chose to use a pottery lantern as a container for the bridal veil spirea that is blooming profusely around the side of the porch. I put a plastic container of water inside the pottery and then arranged the flowers. Every vignette needs a tall element. And what better than summer flowers to make this vertical statement. After all, they are abundant this time of year! As the summer rolls on the flowers will change. Soon, peonies will fill a fluted vase in the spot that now holds the spirea. Almost a must for me is to stack a couple books to put my vase on. 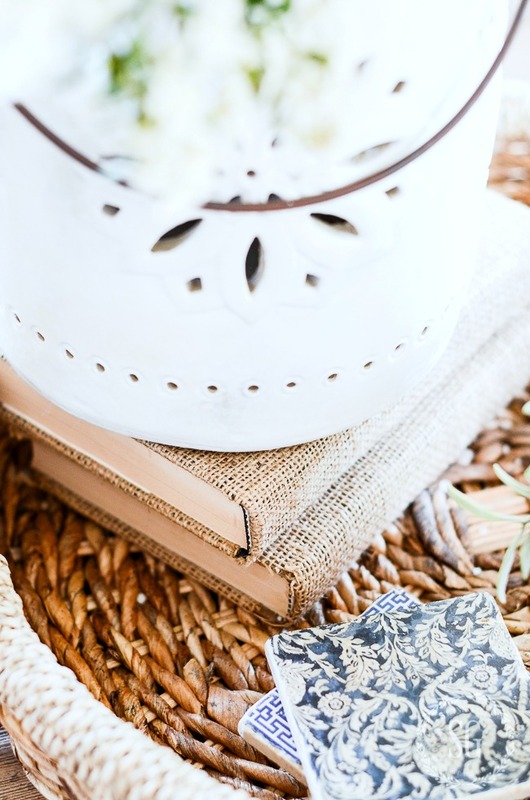 As you probably know, I’m all about the nubbiness of burlap books, especially against the smooth pottery container! If you like a little more color in your vignette, books with bright jackets are a good choice. I like a very tight color palette and lots of white for summer, so nubby burlap books work for me as textural risers! The next thing I chose for my summer vignette is a big, big candle. The spirea overtakes it and that’s okay because for now, I’m not lighting it. The candlestick is not as high as the flowers and that is the look I was going for. Make sure to vary heights of decor elements in a vignette! Nothing makes a vignette fall flat like things all the same size. A big no-no! The candle and chunky candlestick work with the vignette and the crazing on it is a pretty detail! 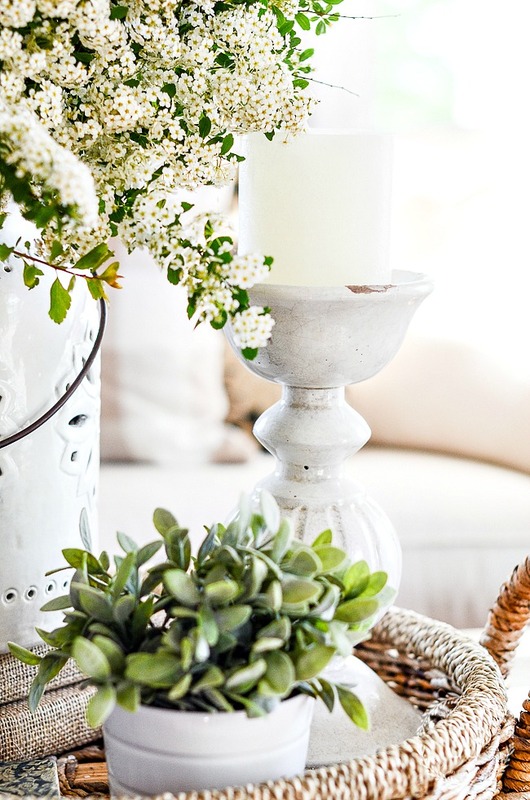 A candlestick is a great item for a vignette! To round off this vignette I added a faux plant in a white planter. I love these plants and little pots from Ikea! I have a handful of them. They are inexpensive, and very good fakes and are amazing to tuck into decor! This little plant calls attention to the lower parts of the vignette. You really need to get up close to see that it is not the real thing! An easy trio in my basket makes a nice looking vignette that hits on many of the elements that make a vignette worthy of looking at. And so easy to create! 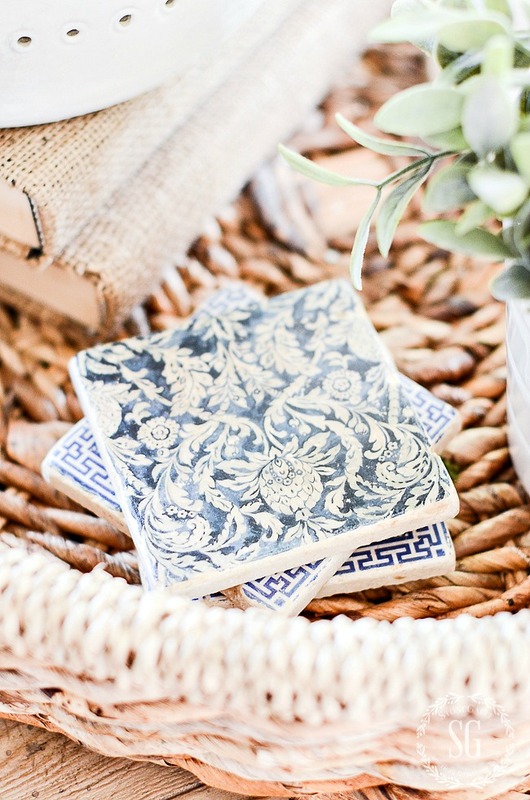 I threw in a few blue tile coasters to have them on hand for guests! Now, it’s your turn! 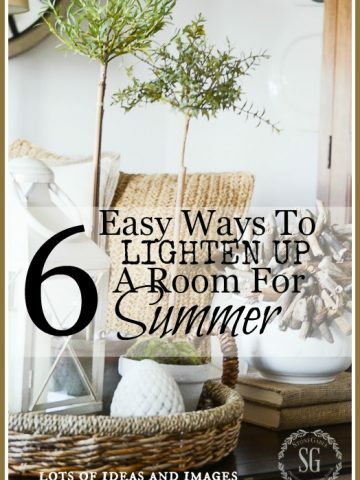 Create an easy, breezy, fun and beautiful vignette that will last all summer long!!!! You may want to follow me on Pinterest and see what I’m finding to pin every day HERE. 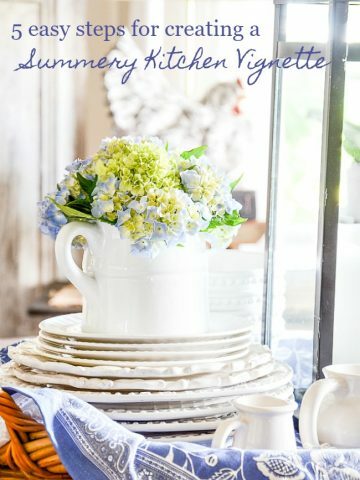 I am totally inspired to put together a few summer vignettes. Thank for the beautiful inspiration? What a talent you have! Incredibly beautiful! There is a lovely picture of tall skinny townhouses in black and white with two green stylized trees in front. Will you possibly comment on the source. I love it! The pop of blue with the white and wicker really makes this vignette for me. I am addicted to Home Goods, by the way! Oh my those blooms are beautiful! I’m in love with that candlestick too. I like how the top of it is more like a bowl that the candle sits in; very different than what I’m used to seeing. I love your vignette ideas and am a big “copycat”. Of course, mine don’t look exactly like yours but your ideas provide so much inspiration. I was at IKEA last week and picked up a few of the artificial plants similar to the one in this vignette even before I saw this! I’m going to my mom’s yard to cut a few sprigs of spirea and get started! Thanks for this post, Yvonne! 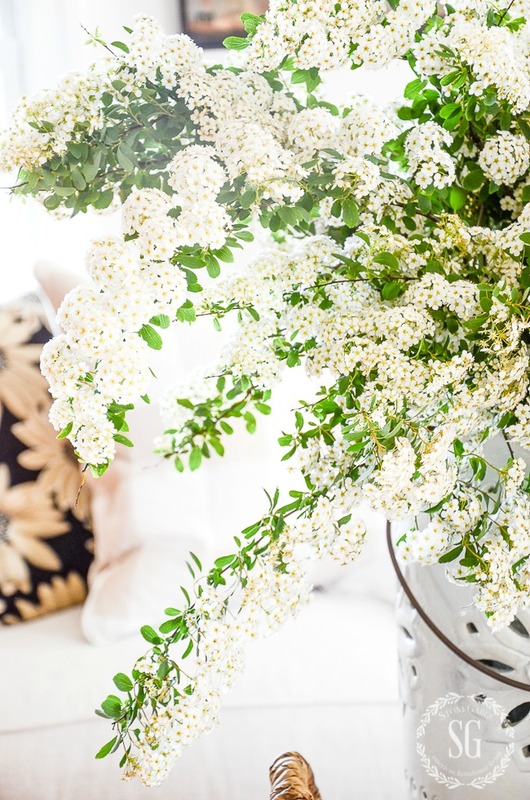 We had spirea in our back yard when I was growing up, I really loved it. This post made me remember them, I can almost smell the blossoms! You have inspired me with your examples of vignettes throughout the years. I change them seasonally. Continued recovery successes. I always love the vignettes you create and I have copied them multiple times! Thank you for sharing your ideas and inspiring me to create them! Love the little vignette you created and all the tips to pull it together. I always struggle with creating vingettes in my decorating. Arranging furniture is fun, but the small stuff eludes me. Thank you, thank you for the great tips. I love the selections and how you have them arranged. Niceeeeee! Love this! 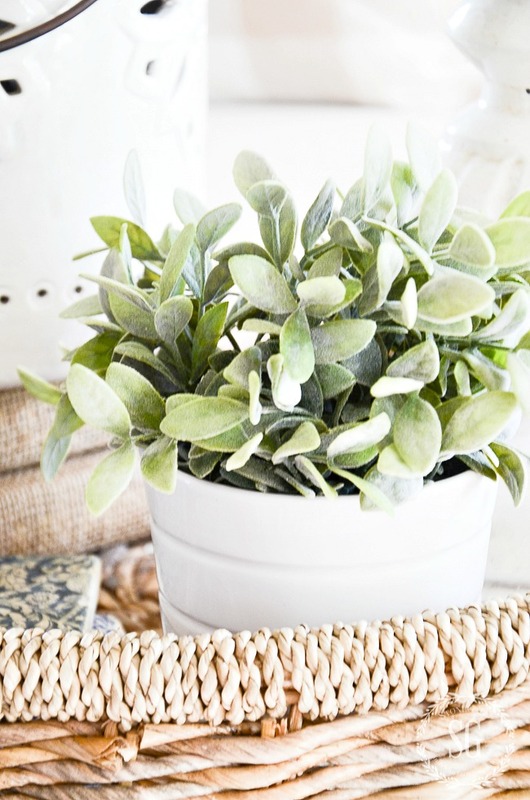 Such an easy way to add a little spring to a room! Love this vignette and remember bringing huge bouquets of these flowers in every spring when I was younger. I don’t have the bush in my yard – it’s way too small for how big these guys grow which is a shame. They make wonderful centerpieces. I just tried to email you and it would’t go through. Something about the Captcha thing at the bottom of the page! How do I get a hold of you?! I need to email DT&T the ‘vignette’ my friend, Peg, sent me today as she and I were listening to the podcast at our separate homes. I laughed SO hard! I’ve just discovered your podcast and had to come out a face to the voice!! What am I crushing on right now? You’re blog! And the cherry on top is that you love Jesus! I’m so looking forward to joining you on your decorating adventures. Thanks Yvonne! Your vignette is very pretty, thanks for the tips. I’ve been running up against a block wall –when it comes to doing vignettes and decorating my trays–I get stuck. So the visual examples are very helpful now. Thank you for continuing with the print format. It is like a magazine that I can read and refer back to at my leisure!! 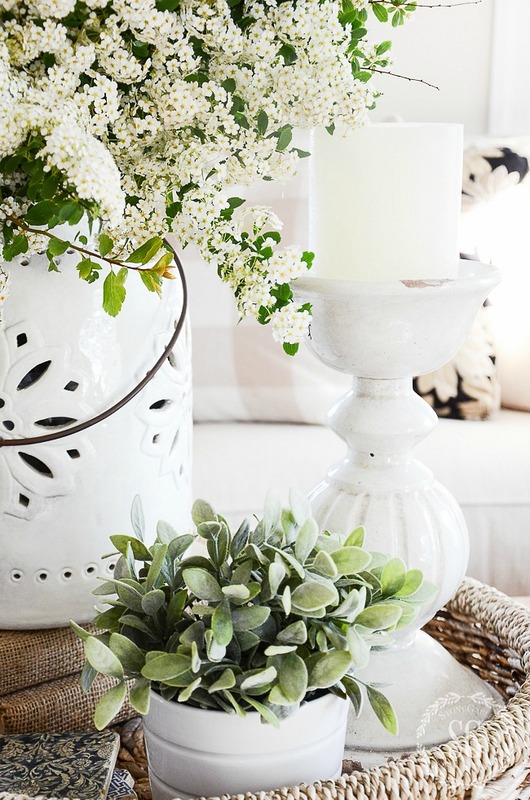 That vignette makes me feel like summer can’t be that far away… lovely! Pretty, Pretty,Pretty .. you’ve got the creative touch we love! Love this vignette! I think I can do something similar! Thanks for the inspiration. I am going to pin this post. I am always looking for ideas for vignettes, in fact I was asked to do one for my friend. Thanks for the inspiration. I love your basket. What a score for you. The spires is so sweet. Ohhhh, in love with the blue coasters! I enjoyed so much! Thank you. Now I’m off to create my own vignette. Beautiful! Let’s have a tall ice tea on the front porch. Your spirea is so pretty. Yvonne I’m *addicted* to those little potted plants from IKEA! Always love to see new ideas for vignettes and this one is beautiful. Love the idea to put fresh flowers whatever we have in our backyard or get some at the store. Love the podcast too! A gray morning here, and I was just moping–just the pick-me-up I need to get me up and rearranging. Thanks~! Love your vignette this morning. What a clever idea to use the lantern, I see them everywhere and never imagined using one for a floral statement, just beautiful. I too love to shop at Ikea and have a few of their little faux plants, so cute. I am learning so many wonderful things since I joined our blog-loving every newsletter I get. Very beautiful. I love the summery look and the use of fresh flowers. I find vignettes difficult…thanks for your help! I have the basket, now for the rest! Thanks for the inspiration! Love the white and green together, so fresh. Your vignette is beautiful! I worked with my basket 2 weeks ago. I got frustrated and put it up…thanks for the pointers! Don’t you love finding great treasures at wonderful prices? Good for you! So light and airy, lovely vignette. Your home is so lovely and having blooming plants right outside is perfect. I am filling vases with lilacs right now since they are right outside our door. Beautiful! Great tips that I’m going to try this week. Gorgeous as always!!! LOVE IT!!!! Found two cutout lattice china lanterns in a discount grocery store for $6.99! Great shade of green. Will be great on my mantle with candles or used single in vignette with flowers. 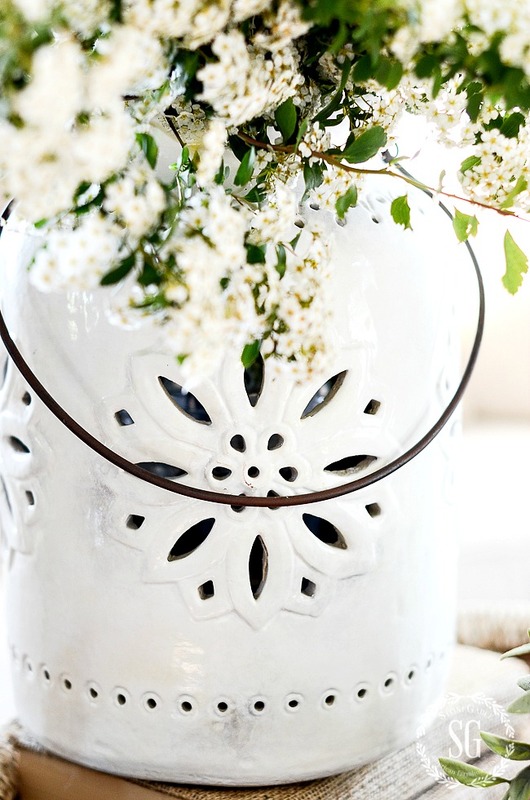 Still enjoying my spring decor but come June these lanterns will be perfect. The summer flowers just make your basket tray come alive! I love the look!! Love this vignette!! What’s the approx. diameter of the wicker tray? Thanks!! The tray is about 20 inches in diameter. 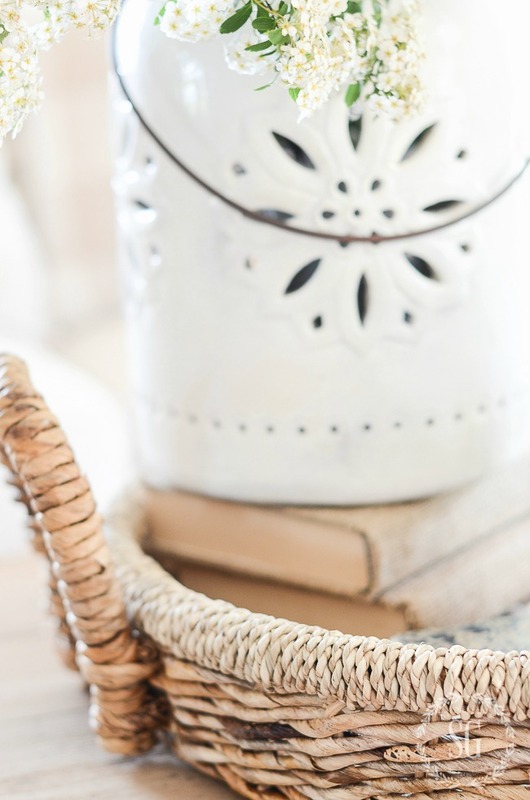 I absolutely love the way you change things for different seasons…but where do you store things not in use? I have a huge problem with storage and organizing. HELP! I have a basement that has lots and lots of shelves! My peonies are blooming, guess it’s time to cut some! 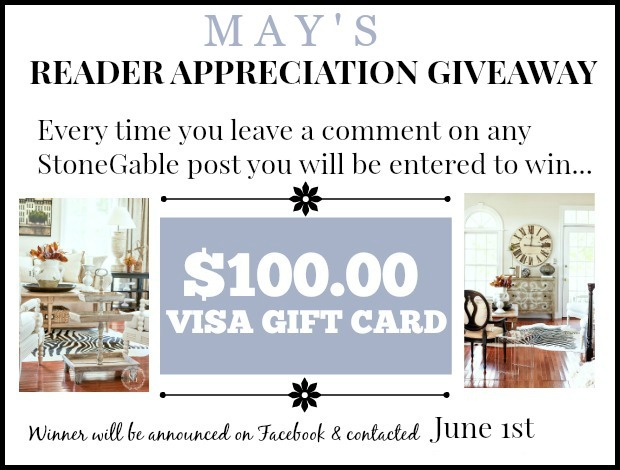 Love all your vignettes and this one is no exception! Lovely, lovely, lovely. Beautiful vignette. Gathering inspiration so that when my kitchen and all the “dust” is gone I can have fresh ideas all ready to go. This is simple and beautiful! Where will you use this vignette? The vignette shown is on my living room coffee table. But I have one on my family room coffee table and one on my kitchen table too! Thanks for great advice and a very pretty vignette! Stems and fronds indoors in simple ways. Ferns and herbs in interesting bottles, for instance! To be inspired is to be energized….thanks for your inspirations!!!! YOU GO GIRL! That is exactly what I am talking about! Your spring vignette inspired me to “putter” and that inspired decorating which inspired cleaning. I’m on a roll! I love to putter too! Very pretty! I can do this one. ? Thanks for the inspiration! 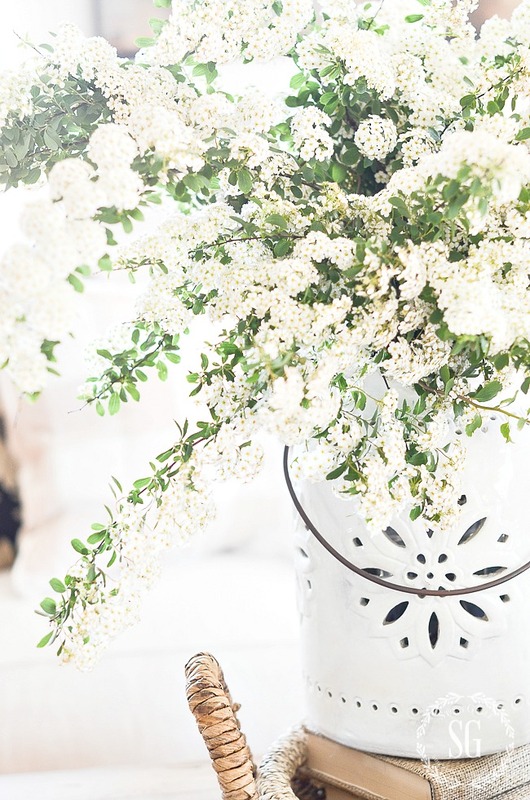 I love everything about this vignette! Beautiful! Very beautiful! Your vignettes are my favorite! I’ve searched and searched (mostly on eBay) for one of the Pottery Barn snowflake ceramic lanterns. I know they don’t make them any longer, but I keep hoping someone, somewhere – will have one or two to sell. They’re fantastic! I love how you use them all year long. I love this vignette! The spirea is gorgeous! I’ll have to check and see if it’s available in zone 9. I pinned it! 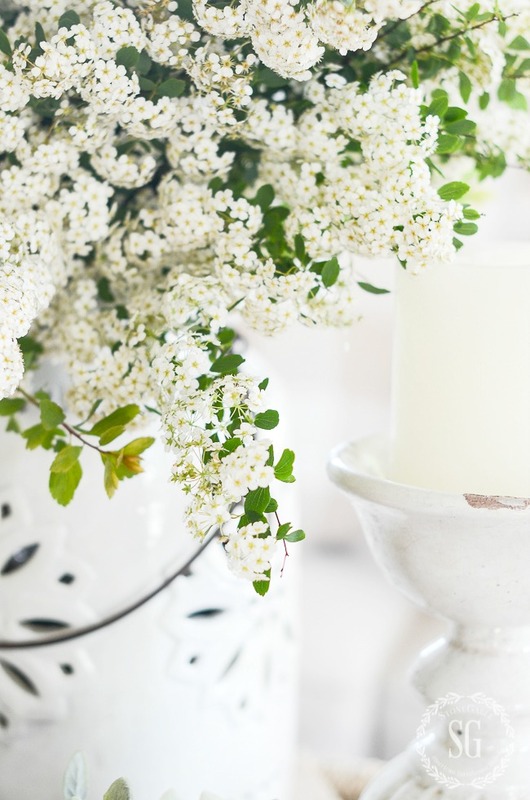 Time to transition from my spring vignettes to summer decor. Thanks for mentioning that all types of containers can be used for floral arrangements by inserting plastic liners. Need to keep that in mind for my summer vignettes. Thanks for all your inspiration. Love your vignette. You make everything look so easy. Time for me to make a couple too. Oh so pretty and fresh looking….and that basket!! Beautiful! And I love your little faux plant. It does look real! I never thought to look at Ikea for artificial greenery. Glad to know! I love love love my pinners! Thanks so so much! What a lovely vignette! I learn so much when you share these decorating ideas. I thank you! So glad to hear that Karen! My goal is to inspire! I love this idea. Thanks for the inspiration. It is beautiful and very easy to accomplish. Beautiful – you are so talented.